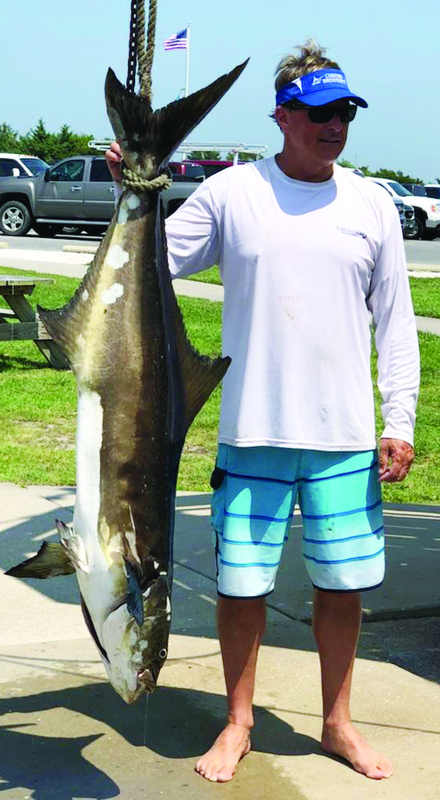 Ocean View’s John Burbage landed this state record, 79-pound cobia on Aug. 10. DNREC’s Division of Fish & Wildlife confirmed on Sept. 11 a new state record in the Delaware Sport Fishing Tournament: a 79-pound, 6.4-ounce cobia, caught in the Atlantic Ocean on Aug. 10 by John Burbage of Ocean View. The fish was 56.5 inches long and had a girth of 28.25 inches. Burbage was fishing alone, about 1.5 miles off the Bethany coast, when he caught the record fish. He hooked the cobia by sight-casting with an Atlantic menhaden (bunker), and fought the fish for 70 minutes before finally landing his trophy. The record catch was weighed at Hook’em & Cook’em, an official Delaware Sport Fishing Tournament weigh station, located at the Indian River Inlet, and confirmed by Fish & Wildlife Natural Resources Police officers Sr. Cpl. Oran White and OFC Timothy Koebel. For a listing of all state fishing records, visit the Division of Fish & Wildlife’s Delaware Fishing Records webpage at http://www.dnrec.delaware.gov/fw/Fisheries/Pages/FishRecords.aspx. More information on the Delaware Sport Fishing Tournament can be found in the 2018 Delaware Fishing Guide, online at http://www.eregulations.com/delaware/fishing/. The guide also is available in printed form from license agents throughout the state.